Swing from the heights of 40 meters with the only double swing of its kind in the world! 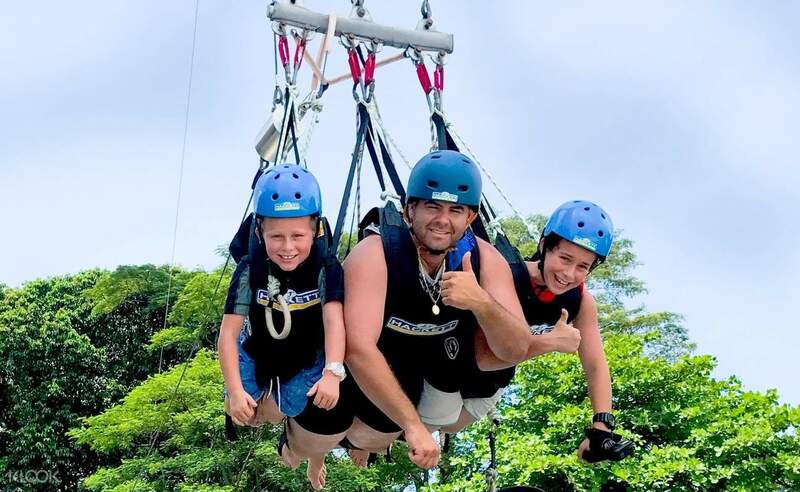 The Giant Swing has an innovative new technology that will allow you and your friend to race against each other after you're dropped from the 40 meter jump off point! The best part? You get to swing while overlooking the stunning sights of Siloso Beach, and get a once in a lifetime view! 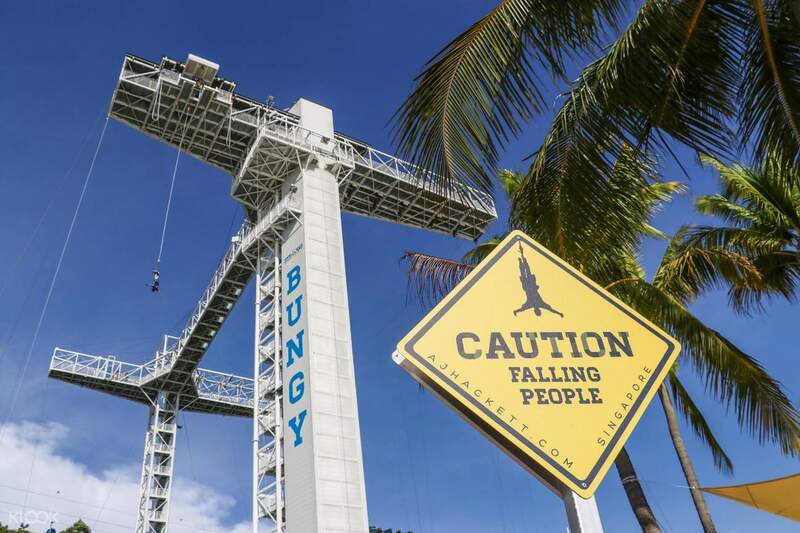 Once you've reached the 40 meter height, you can pull the release and descent to the ground at exciting speeds of over 100km/hr - a fantastic experience for thrill seekers! Ride the Giant Swing and soar at speeds of 120km/hr and over! One of the must do activities when visiting Singapore, really exciting and fun. If you cant accept bungy jump its okay just invite your friends for giant swing. The staffs n crews here are very friendly and accomodating. One of the must do activities when visiting Singapore, really exciting and fun. If you cant accept bungy jump its okay just invite your friends for giant swing. The staffs n crews here are very friendly and accomodating. Went way too fast but was an interesting experience nonetheless. Good for adrenaline junkies. Didn't manage to get photos while actually there. Went way too fast but was an interesting experience nonetheless. Good for adrenaline junkies. Didn't manage to get photos while actually there. Drag all of my friends to do this with me and did not regret it at all. A once in a lifetime experience! The staff were all friendly and nice. Drag all of my friends to do this with me and did not regret it at all. A once in a lifetime experience! The staff were all friendly and nice. This is activity is probably not as scary as bungy jumping because I get to do it with my husband! The staff were really friendly and helpful, they even help took a picture of us before and after the activity. The staff briefed us well and prepared us for the Giant Swing. Highly recommended for people who want to try something challenging for the first time! This is activity is probably not as scary as bungy jumping because I get to do it with my husband! The staff were really friendly and helpful, they even help took a picture of us before and after the activity. The staff briefed us well and prepared us for the Giant Swing. Highly recommended for people who want to try something challenging for the first time! My partner wasn’t thrilled to do this activity but he loved after it was done and dusted! Easily redeemed at the counter. Lovely staff. We paid $49 extra for the video. My partner wasn’t thrilled to do this activity but he loved after it was done and dusted! Easily redeemed at the counter. Lovely staff. We paid $49 extra for the video. Really have fun! Recommend to play in the evening. The sunset is great and romantic. Only one thing to remind that you have to pay 40 dollars if you want the video back. Really have fun! Recommend to play in the evening. The sunset is great and romantic. Only one thing to remind that you have to pay 40 dollars if you want the video back. This is a must try activity especially if you love Adrenaline rush.. You will be above 40m high and swing down at high speeds.. 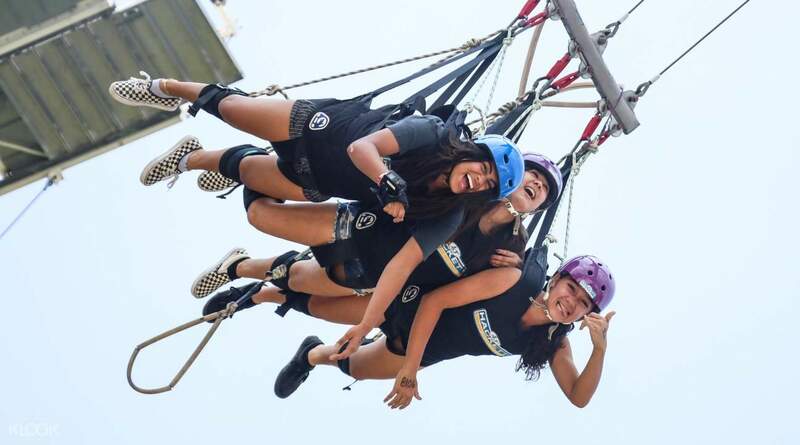 This is a must try activity especially if you love Adrenaline rush.. You will be above 40m high and swing down at high speeds..
No issues with redemption and quick. Good experience and exhilarating thing to do when your on Sentosa island. one person holds the go pro and the other one pulls the rope. No issues with redemption and quick. Good experience and exhilarating thing to do when your on Sentosa island. one person holds the go pro and the other one pulls the rope.